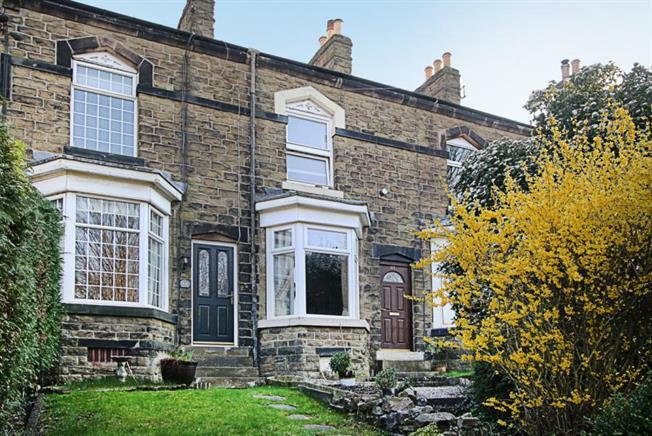 3 Bedroom Terraced House For Sale in Sheffield for £195,000. Only upon internal inspection can this stunning stone fronted three bedroom mid terraced family home be fully appreciated. Fantastically presented throughout offering well-proportioned living accommodation over all three floors, retaining many original characterful features with high ceilings and boasting a larger than average plot occupying an elevated position with off road parking for up to two vehicles to the rear, along with a good sized rear garden. Situated at the heart of Eckington village well placed for local amenities, schools and motorway networks Access to Sheffield City centre and nearby Dronfield and Chesterfield. Early viewing is advised. The accommodation in brief comprises: Bay fronted lounge with laminate to the floor, inner lobby with stairs rising to the first floor landing, dining room with a beautiful cast iron feature fire surround, French style doors accessing the rear garden, door to the cellar and open plan with laminate to the floor through to the off shot kitchen where there is a range of wall and base units, integrated appliances to include electric hob, oven, extractor fan and dishwasher, along with space and plumbing for a fridge/freezer and automatic washing machine. The kitchen also houses the gas heating boiler (recently replaced approx. 1 yr ago) Rear entrance lobby with entrance door leading to the rear garden and access to the ground floor wc. First floor landing, front facing master bedroom with built in storage cupboard, rear facing bedroom two and attractive family bathroom fitted with a three piece suite in white comprising wash hand basin, low flush wc and roll top bath, tiling to the splash backs, tiling to the floor and built in storage cupboard. A stair case rises from the first floor landing to the Attic bedroom three where there is front and rear facing velux sky lights with built in black out blinds, storage to the eves and a door leading to an en suite WC. Externally: Steps and a well-stocked garden rise to the front elevation, whilst to the rear of the property is a good sized child/ pet friendly enclosed rear garden being mainly laid to lawn with Indian sandstone flagged patio area and outside water tap. Gated access leads to the rear allocated off road parking spaces. Location: Eckington village is steeped in local history, conservation areas and offers a host of superb local amenities, schools and a local supermarket. The area boasts a public swimming baths and superb local restaurants and gastro style eateries in the surrounding areas. Ideally situated for links to the M1 motorway networks, Sheffield city centre and nearby Crystal Peaks shopping centre. Renishaw Hall and local surrounding countryside and walks on the Pennine trail provide plenty of choice. The area is popular with buyers of all ages and has excellent bus and transport links.